There are several different ways to improve cellular reception to your Verizon LTE Internet and Home Phone (NOVT1114V) for faster Internet speeds. 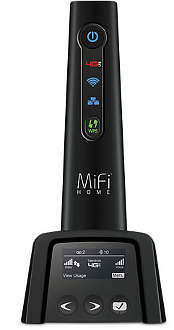 You can boost the reception of your router with an external antenna or powered signal booster. Adding an external to will improve cellular reception which will improve data transfer speeds. Adding a powered cellular signal booster will improve reception even more. Signal Booster Repeater System - Cover's a larger area - Home, Office, Large Buildings. 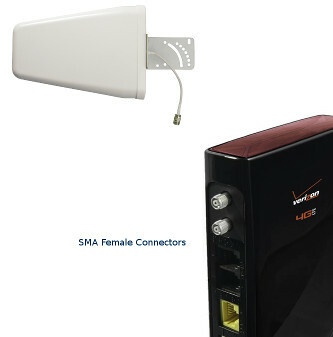 The Verizon LTE Internet Home Phone has 2 antenna connectors on the rear of the unit. One port is for data and the other is for voice. You can attach an antenna to improve the signal for either or 2 antennas to improve the signal for both. The antenna ports on the NOVT1114 are "SMA Female" connectors. Attaching a cellular antenna to the router requires an antenna cable ending in a SMA Male. To attach an external antenna to the router you'll need an antenna and cable going between the router and external antenna. Ideally, you want to place the external antenna where the cellular signal from Verizon is best. It is usually better to mount the antenna outdoors if possible. Directional antennas should be permanently mounted pointing directly towards then nearest Verizon tower. An excellent antenna for Verizon 4G LTE is the Wilson Wide Band Directional Antenna (below). CABLE: When selecting cable, match up connectors to the router (SMA) and the antenna (FME or N Type). The use of the screw on adapters "SMA Male/FME Male Adapter 971119" or "SMA Male / N Female Adapter" see product listing below) may be required. Another solution to improving the signal strength to the Verizon LTE Internet Home Phone is to use a cellular repeater type signal booster system. These systems take the available signal outside, amplify it, then rebroadcast the signal inside. These systems do not require a direct connection to your device. They also have the added value of being able to boost the signal to other devices in the area. If you want to boost the signal just to the router and no other devices further away, consider the Wilson Desktop Signal Booster System. We list it and several different options below. Press the select button on the Home screen to display the Menu options. Press the select button to open the the Voice or Data Signal screen and display the current details. The signal reading will be in dBM. It is normal for the signal to fluctuate some. The greater the number, the better the signal. For example, a -70dBM is a good signal and an -100 dBm is a very bad signal.